Custom Equipment LLC recently announced the next generation of Hy-Brid Lifts. The line is being divided into 3 series – the Push-Around Series, Pro Series and Zero-Turn Series – to simplify the selection process. This includes a number of safety and productivity enhancements to the existing products, as well as the introduction of 2 new models: the PA-1030 and ZT-1630. Users will find reduced fatigue and improved safety by eliminating the repetitive climbing up ladder and scaffold rungs. A large work platform boosts productivity, allowing for ample room for the operator, tools and materials. The auto-lock brakes and total-lock rear casters prevent unintended movement, increasing safety. In addition, users will experience improved stability and reduced platform movement with the robust scissor stack and oversized pins. Finally, navigation through a tight workspace is made easy thanks to the PA Series lifts’ compact size and lightweight design. The PS Series lifts address specific needs of professionals working indoors in applications that require operators to work at elevated positions for prolonged periods of time, including construction and facility maintenance. 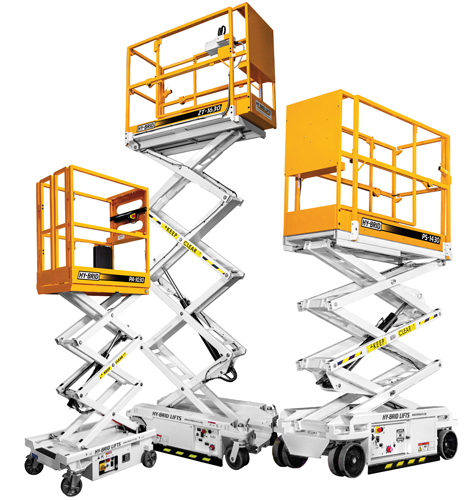 Contractors will see increased productivity and flexibility with these easy-to-maneuver lifts, replacing the need for 5.8 m lifts on a jobsite. The PS Series lifts’ large work platform and high lift capacity allow contractors to bring more tools and materials and get more done per trip up the lift. Plus, an ergonomic design and built-in tool tray improves productivity while on the lift. The machine’s lightweight design allows access to delicate surfaces or fresh concrete early with the lowest floor-loading pressures in the industry. In addition, the lifts’ compact size gives it the ability to fit through standard doorways and elevators, simplifying movement through buildings. The ZT Series is the most compact series in the lineup, which allows for access to areas other lifts cannot. The lifts’ innovative point-and-go style drive provides unrivaled maneuverability in confined spaces. Proportional controls provide optimal lift positioning and precise jobsite mobility. Users are able to move the lift little by little or rapidly with the joystick controls. It also includes the built-in tool tray and signature lightweight design of Hy-Brid Lifts, which allows for earlier access to sensitive flooring. All Hy-Brid Lifts are heavy-duty, safe and lightweight, with low wheel loads that allow users to maneuver them over delicate floors and get onto green concrete sooner.